Park at the eastern end of the Cookie pullouts by the huge boulder. Walk up and behind this boulder angling to the left (west). Be watchful for the remnants of the old road, once you find it at the edge of the talus, walk it west. You should see the Cookie, then walk a bit further to the climber use trail. Up this trail you will find a left facing, blocky looking corner. This is the start. Take a standard rack for the bottom of the first pitch and the second pitch. 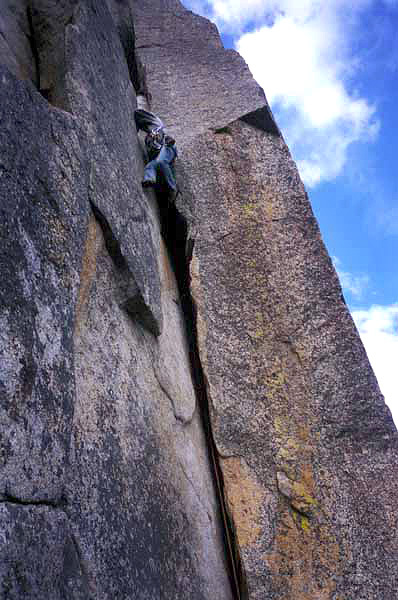 The OW section of the first pitch (or see below) protects with wide modern gear. Take 2 #6 Technical Friends, 2 #4.5 BD old camelots and maybe one #4... we also had a #9 Valley Giant which was really nice! but you don\'t need it if you reach way back into the pod to get gear in. Scott styling the exit moves out of the pod and into the lieback. First pitch up the fun 5.9 chimney to the ledge at the left facing corner with the offwidth. Belay on this ledge. Second pitch up the 5.10a OW. Take the wide gear, and also one each 1", 2" and 3" to build an anchor. This is a short pitch, but you\'ll welcome a chance to rest above it, it is fierce and the exit at the top suggests right side in at the bottom. Third pitch up the 5.8 corner to the top of the Cookie.